Prophylactic paracetamol is being recommended with the first Men B vaccinations because of concern that fever may reduce the subsequent vaccine uptake. This contradicts current advice in the Green Book, but is based on a recent trial which demonstrated no reduction in the response to vaccination after paracetamol. Despite paracetamol, 40% of babies will develop fever after Men B vaccine, but no exception has been made to NICE guidance CG160 for post-vaccination fever. Please see our update presentation for more information. Our e-learning course provides health visitors with a comprehensive tour through the critical subject of minor illness in the under fives. 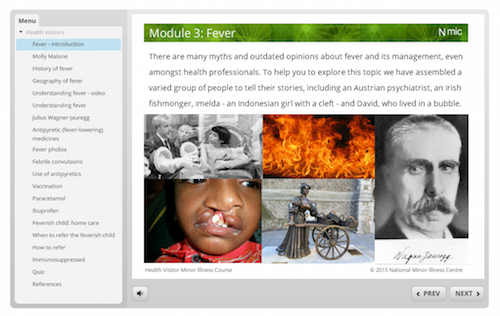 With 5 hours worth of CPD learning, we cover assessment, fever, ENT, conjunctivitis, breathing difficulty, cough, diarrhoea, vomiting, UTIs, skin complaints and more using our interactive online presentations, with video, audio and photos to guide you through the materials. We also provide an update for community practitioner prescribers. Try our sample course [press Login as Guest] if you would like to see the style of the course. Please note that the Firefox browser is not supported. Launch event - while stocks last - we are offering a free NMIC minor illness toolkit with each course purchased. This contains the essentials for conducting assessments on children including an LED pentorch and an axillary thermometer. On completion of this course you will receive a certificate as well as a voucher code to receive a discount when purchasing our book on this subject. The course can be purchased from our online shop.